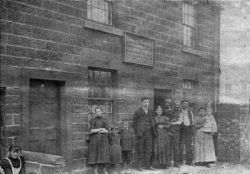 Welcome to the Stables Family History Web-Site, which aims to document the history and ancestry of the Stables families in Yorkshire from their origins around Leeds through to their modern expansion into the whole of Yorkshire and beyond. This is the definitive reference to the history of the STABLES surname within Yorkshire and the surrounding counties. The Family History section of this site tells the story of the Stables families of Yorkshire, through transcripts and photographs of surviving manuscripts, archive material, wills, memorials, maps, family bibles, photo albums, etc. These records go back as far as the 14th Century. This site contains over 300 pages of Stables information. The Family Tree section contains the latest South Yorkshire Stables family tree now linking 1060 people from the early 1500s through to today. Did you know that every living South Yorkshire Stables is descended from one man? The Research section of the site contains comprehensive reference material such as transcripts of parish register entries, census returns, birth/marriage/death certificates, references to documents in County Archives, Probate Records, Will Indices, etc. These will also be of interest to those researching the Stables surname in all parts of Yorkshire. The News section contains details of the latest discoveries about the Stables families and the latest additions/changes to the web-site. You can also join the Stables Mailing List and receive future news directly by email. Did you know that everyone in Yorkshire with the surname STABLES can be traced to one of just three branches? Over the centuries, Stables families have lived in many key towns of Yorkshire, leaving behind historical records that give fascinating insights into their lives and times. Find out more about the Stables families in these Yorkshire parishes. Over the course of our research, some fascinating records relating to the Stables family have been uncovered. These are just a few of the highlights, you will find dozens more on this web-site. Oldest Stables probate records, 1397.